Kroger stores are now offering coupons for the Luvsome line of dog and cat foods. Luvsome specializes in high quality, nutritionally balanced pet foods. Their line of foods is made from a high percentage of meat meal, unlike many other brands which have grains as their first ingredient. In addition, their dog foods are guaranteed to be made of at least 25% crude protein. Luvsome also boasts about their nutritional content including calcium, linoleic acid, vitamin E and selenium. Their line of cat foods also has meat meal as their first and primary ingredient and contains at least 32% crude protein. In addition, their cat foods contain essential fatty acids, zinc, vitamin A and taurine. The digital coupons are available for your purchase of Luvsome dog and cat food at all Kroger stores. Kroger stores include Kroger, Baker’s, Fred Meyer, City Market, Dillon’s, Food4Less, Foods Co., Gerbes, Jay C Food Stores, Ralph’s, Smiths, QFC, Owens, King Soopers, Pay Less Super Markets and Fry’s. You’ll surely find at least one or more of these stores near you if you live in the United States. The coupons available include $1 off when you purchase Luvsome™ Dry Dog or Cat Food (expires 09/03/2016). 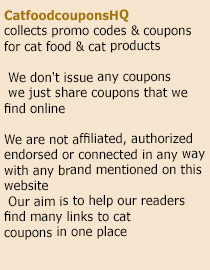 You can find this coupons at Kroger coupons page, under the Pet care section. Simply visit the link above and click on the Sign in to Load link. You’ll need to sign in with your store card to “clip” the coupon and have it applied when you checkout. This entry was posted in Luvsome. Bookmark the permalink.